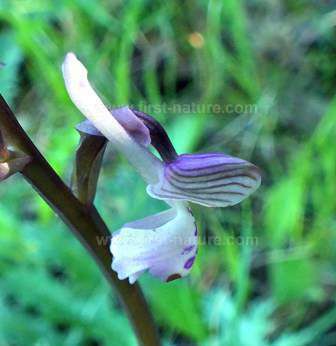 This orchid is a member of the Anacamptis morio (Green-winged Orchid) group and is rather similar to Anacamptis champagneuxii(Champagne Orchid) with which it occurs in the western Mediterranean region. It is, however, a much bigger plant and carries more individual flowers on each spike. Also, unlike the Champagne Orchid, the lip has obvious markings almost in the form of two vertical lines of spots. Anacamptis longicornu also has an exceptionally long spur, up to 17 mm, which is sometimes slightly curved but more often straight. 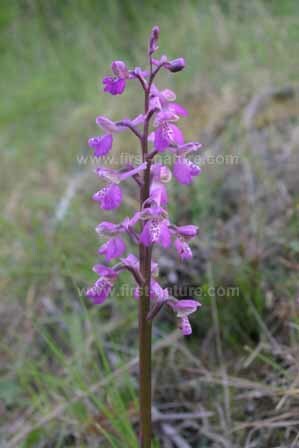 Anacamptis morio is in sharp decline in the UK and other parts of Europe due to the farming industry's excessive use of herbicides, but it is still possible to find it, as well as its close relatives the Champagne Orchid and the Long-spurred Orchid, in large numbers in the Mediterranean countries where traditional farming methods are still the order of the day. Apart from the Iberian Peninsula, where it is well-known, Anacamptis Longicornu occurs also in Corsica, Calabria and other Mediterranean countries. This specimen was photographed in the Algarve in Portugal during April.